In May the monsoons will come again to Asia and with the increased rain will come a sharp increase in the numbers of cases of Malaria as mosquito populations soar. In order to prepare for this event Buzz Off has commenced distribution of Artesunate into remote clinic inside Karen and Shan State. 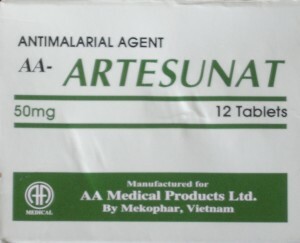 Artesunate is one of the most reliable drugs for the treatment of severe falciparum malaria. The World Health Organization recommends that artemisinin derived drugs such as Artesunate be used only in combination therapy. (Artesunate Combination Therapy (ACT) is the simultaneous use of two or more anti malarial drugs that have independent modes of action in the way they target the malaria parasites.) In 2006 the WHO requested pharmaceutical companies to end the marketing and sale of “single-drug” artemisinin malaria medicines, in order to prevent malaria parasites from developing resistance to this drug. A WHO update on artemisinin resistance can be found here. Buzz Off supports this practice and the Artesunate purchased will be used within WHO guidelines. Whilst other antimalarials such as Doxycycline, Mefloquine and Chloroquine are cheap and readily accessible Artesunate is not. It costs up to 7 times the price of ordinary antimalarials and secure supplies need to be obtained as there is much fake Artesunate on the market. In the coming weeks 700 boxes of Artesunate (8,400 tablets) to remote clinics that are serving IDP camps in Karen and Shan State. Each box has enough Artesunate to treat one adult person for up to 3 days, some cases of severe falciparum malaria need much more than this. Injectable drugs also need to be bought for those patients who are bought to the clinic unconscious and unable to swallow a tablet. These medicines together with follow up deliveries of other antimalarial medications and support medicines will help to save hundreds of lives; but much more medicine is needed to treat the cases of Malaria that will emerge with the coming monsoons. Buzz Off needs to raise $20,000 in order to save 5,000 lives. We are also receiving requests for help from remote clinics in West Papua (Irian Jaya – Indonesia), Papua New Guinea and the Philippines. Your donation can help save a life. You can help by donating to Buzz Off through our on-line store a $10 donation will help us to buy nearly three boxes of Artesunate or support medicines. Donations for these medicines are tax deductible for Australian donors and if you require a tax deductible receipt you should make your donation through the Australian Mercy Secure Website select Buzz Off Meds from the drop down menu. Malaria is a killer – your donation will help to make a real difference in someone’s life.